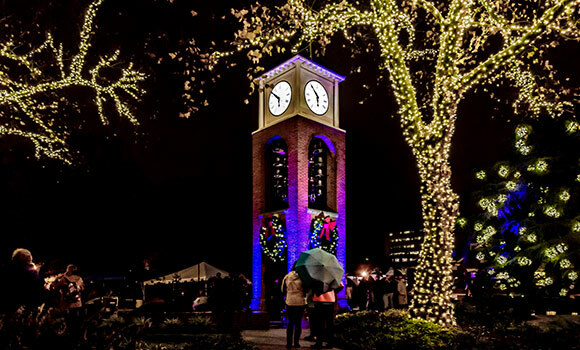 UNCG will host the annual lighting of the Vacc Bell Tower and Anniversary Plaza on Tuesday, Dec. 6, at 5:30 p.m.
Held each year on Reading Day, this campus tradition celebrates the end of the semester and the start of the holiday season. The event, which is free and open to the public, includes musical performances by the UNCG Steel Band and the Grimsley High School Madrigal Singers, remarks by Chancellor Franklin D. Gilliam, Jr. and dessert and hot cocoa for all. The lighting of the bell tower and plaza is held in conjunction with the 47-year-old student tradition of placing luminaries throughout campus on Reading Day. Community members are invited to take a stroll down College Avenue (a pedestrian mall) on campus and enjoy the warm glow. The bell tower was given by retired UNCG Professor Dr. Nancy Vacc in honor of her late husband Dr. Nicholas Vacc, who served as chair of the Department of Counseling and Educational Development at UNCG. Last year, an additional 24 bells were added, making the tower and its 49 bells one of only six structures in the state to have a full concert carillon.